Are we tired of Valentine's yet? Pink, red....Not! I put together a romantic brunch for two. The setting is right off the kitchen on a pub table. Smaller scale for an intimate meal. I layered my plates, starting with American Atlier off -white plates. I then used the cabbage plate, ending up with the rose, heart shaped plate. I think these plates are perfect for Spring too! I know some of us are anxious. I also snuck in another picture with a burgundy charger further down. Beautiful cabbage plates I found today...Good old Ross. I also found this Love heart shaped plate at Ross. I ventured out today and found these cute little heart roses containers. They were perfect for the napkins. I found them at the dollar store. Another dollar store find. A Love glass. They also have them in red. 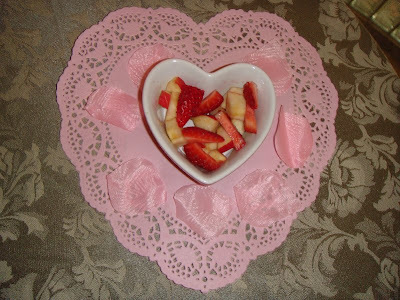 These pink heart shaped dishes are also perfect for Creme Brulee....Yumm! I cut up fruit for today. Here's the Burgundy charger, I got from pier 1 years ago. 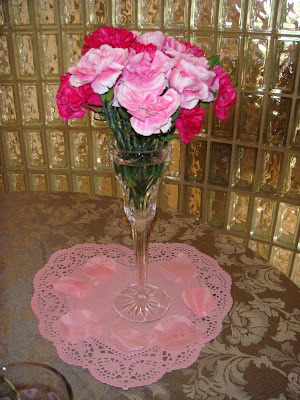 Since my Carnations lasted so long, I am using them again for this tablescape. I put them into a crystal candle holder. 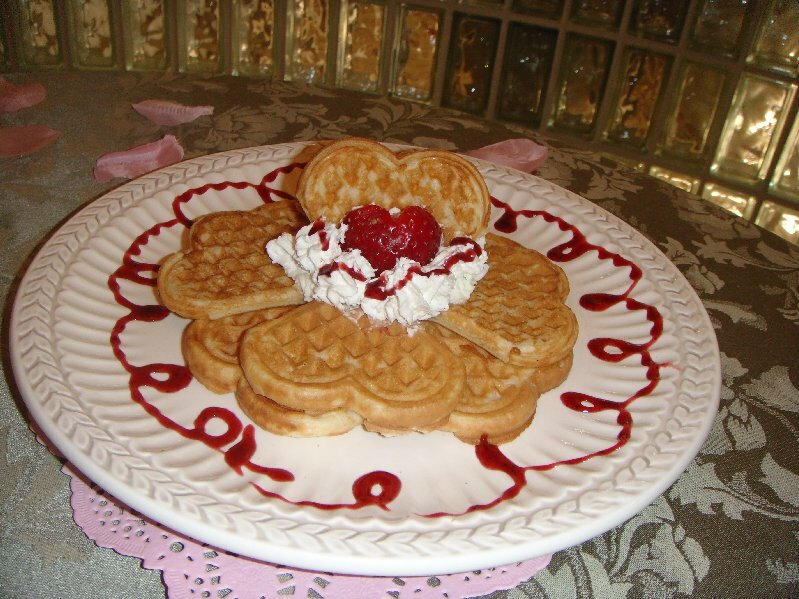 Heart-shaped waffles with whipped cream and strawberries. 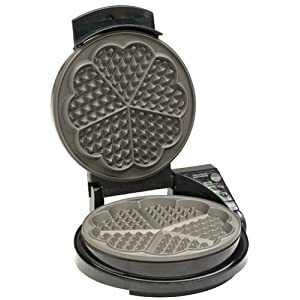 Here's the waffle grill I used. I so appreciate you coming by and visiting. I hope you all have a wonderful Valentine's Day. 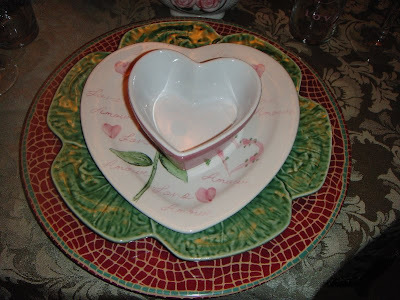 Be sure to check out the previous post to see another Valentine's tablescape. Pink & Green Pretties. 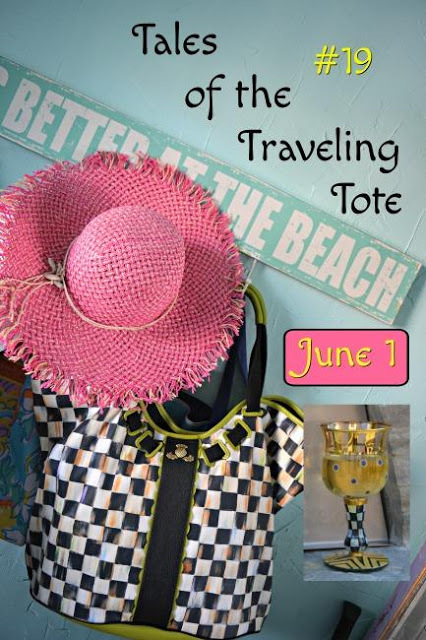 Stop by their blogs and get inspired! What a lovely Valentine's table. The cabbage plates are too pretty. The waffles look yummy! :D I love waffles. Love the plates, but I love the waffles more! 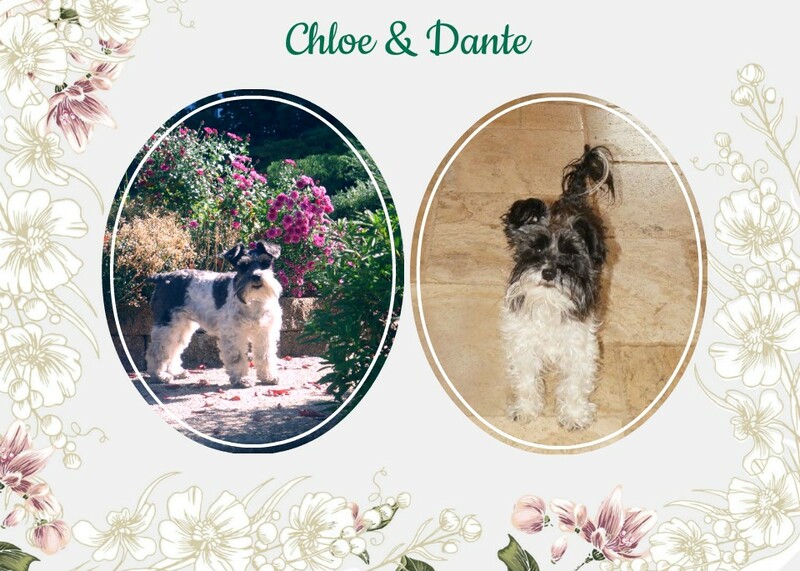 I love how you decorated them! I'll be over at 8 am for waffles and coffee! Happy Valentines Day! Liz! 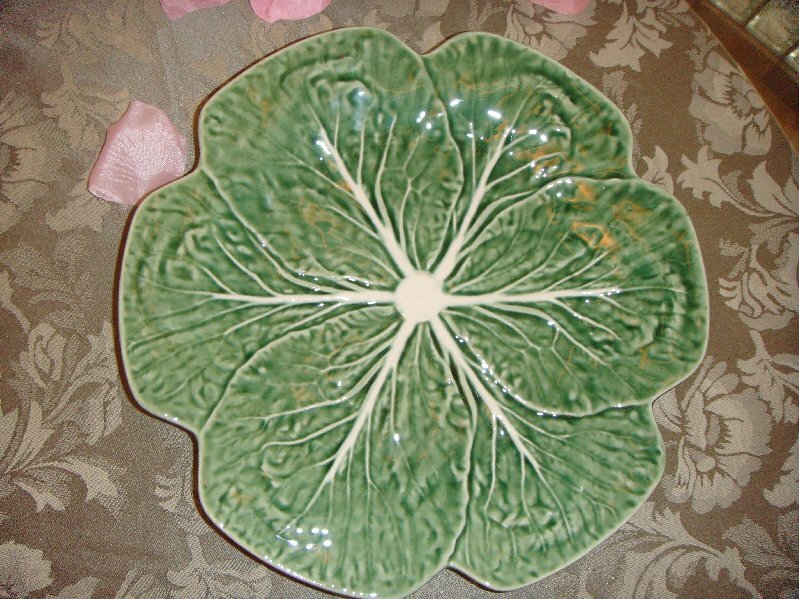 I have always wanted cabbage plates! Everything looks wonderful! 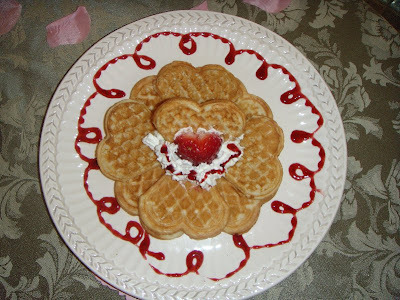 I love the waffle iron! Hi lovely lady. I love your Valentine's table sweet lady is it time for the waffles !! Linda I do love your table, so you like my coffee cups. I just post my tablescape and the coffee cups are part of my Valentine's day I hope you can come see. 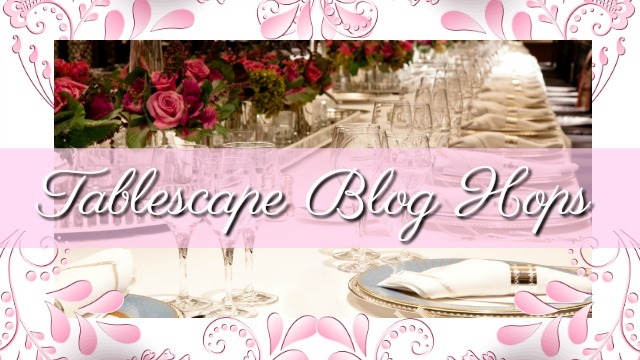 how pretty your cabbage and roses tablescape is. The waffles look so good! Ohhh...you changed your table again, my friend! 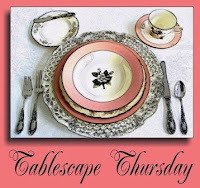 I thought that I just seen a beautiful pink and green tablescape...I had to look back to make sure! hehe! Well dear lady, I absolutely adore you Valentine's table! Love, love, LOVE the heart shaped "Love" plate. Is that a pink rose or a peony...hmmm, I'm wondering? Ohhh yes, I would love to have a set of those! They really look pretty with your new green cabbage plates too! 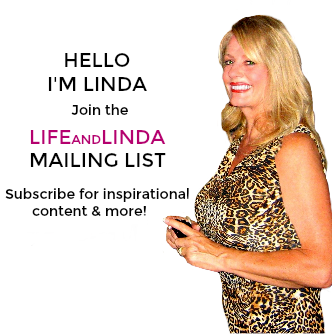 Sooo very pretty, Linda! 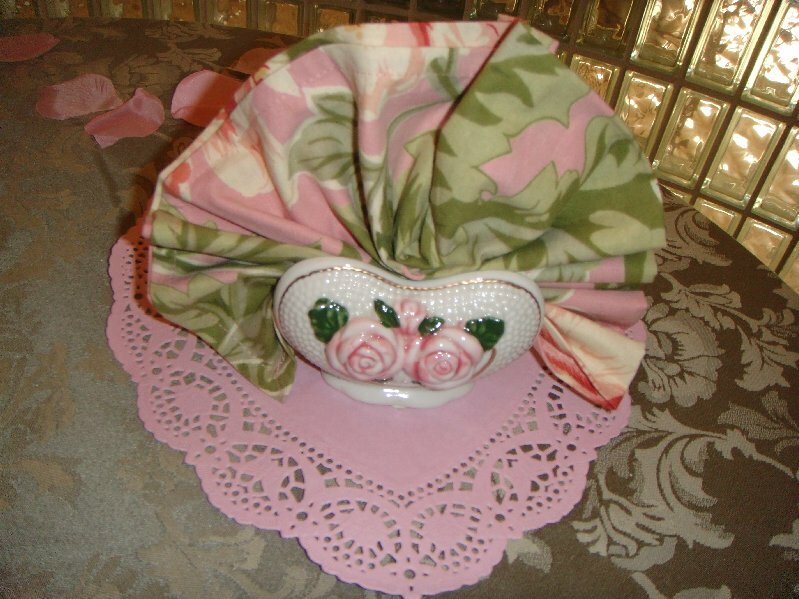 Your pretty pink and green dinner napkins are turning out to be very versatile...they really are beautiful! Thank you so much for sharing this pretty Valentine table with us!!! 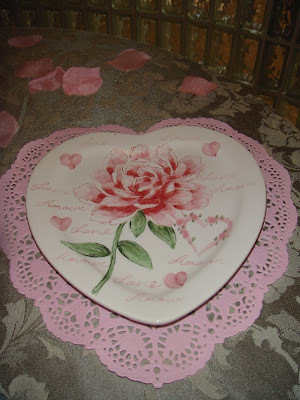 I also wanted to thank you for coming by and taking a peek at my new Valentine place setting! I have so enjoyed our visits, my friend! Your dish finds are wonderful and you put them together so artistically. Love the heart shaped plates with the roses. I love Your table. Count me in on the waffles.. they look delish. Thanks for your visit and your kind comments. This is so beautiful! My favorite colors together are pink and green. I'm really lovin the pink champagne flutes. I have some too but not quite as pretty as those. Linda, what a pretty table! 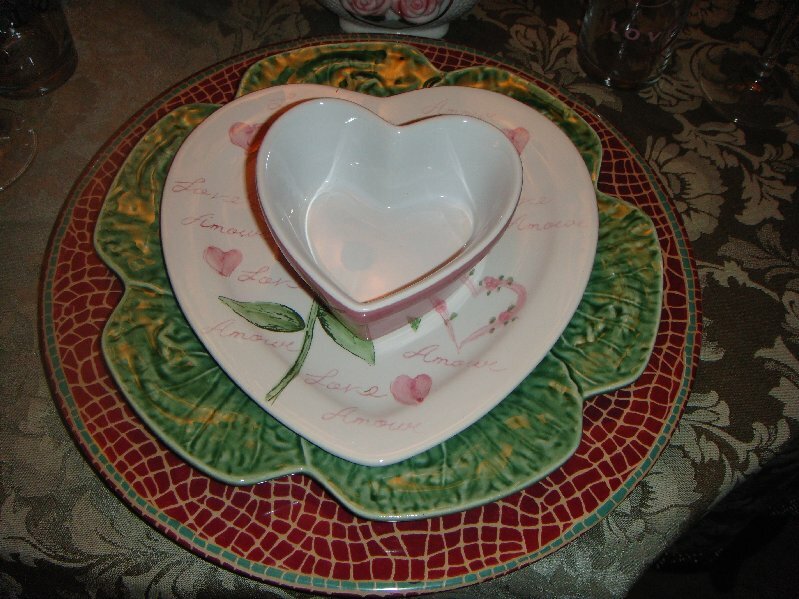 The pink and green look lovely together, and those floral heart-shaped plates are darling! 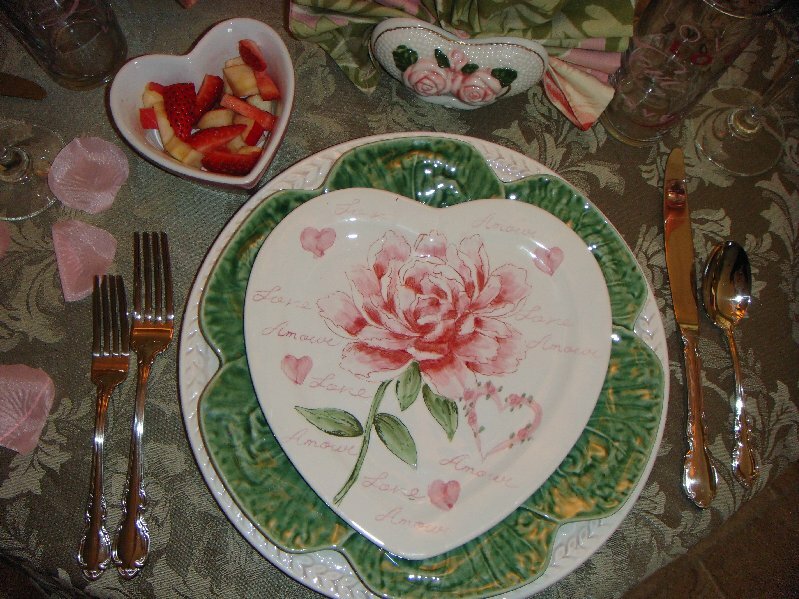 Beautiful table, love the heart plate with the cabbage leaf plate, great choice. 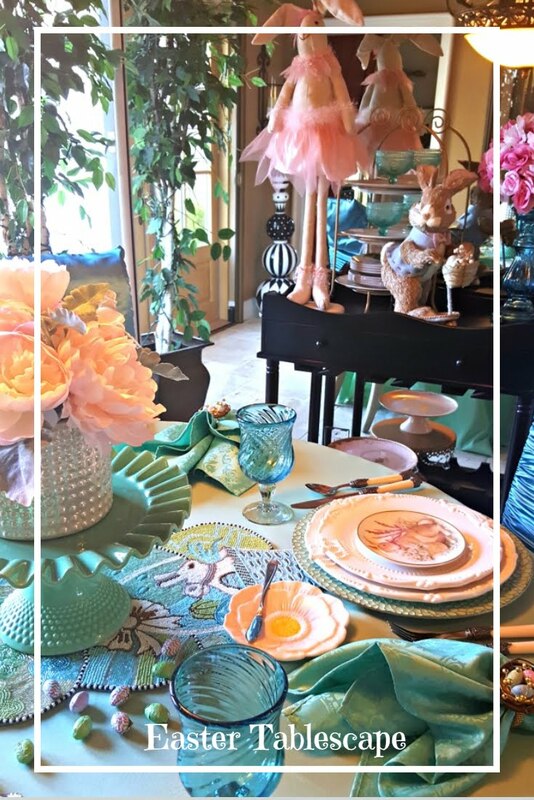 I love the pink and greens in this tablescape! Your plates are adorable. Your tablesetting is so pretty. I've seen both of those plates at Ross but didn't think of putting them together. Love it! Just found your lovely blog via Holiday Haven. I'm your newest follower and would be delighted to have you follow me back! Linda, what a lovely and romantic table you've set for Valentine's day. I'm very fond of those green cabbage plates. From the comments, I'm not the only one who is admiring those plates. 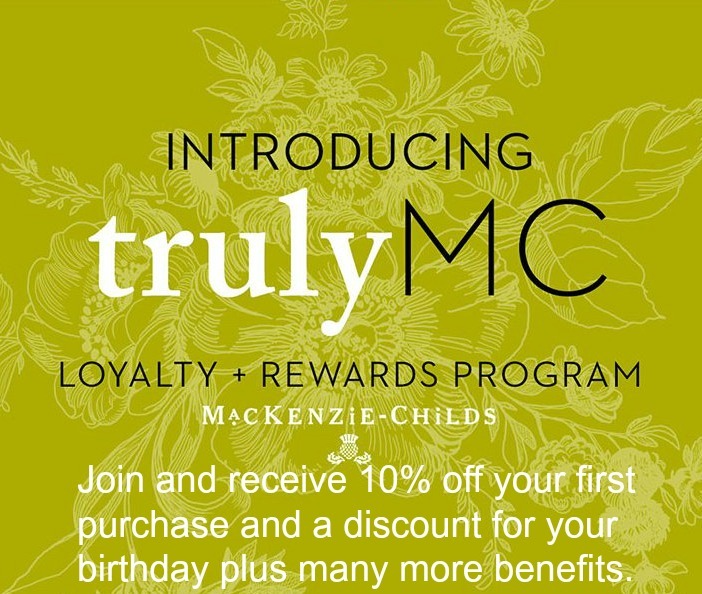 It's my pleasure to meet you and I look forward to getting to know you better. 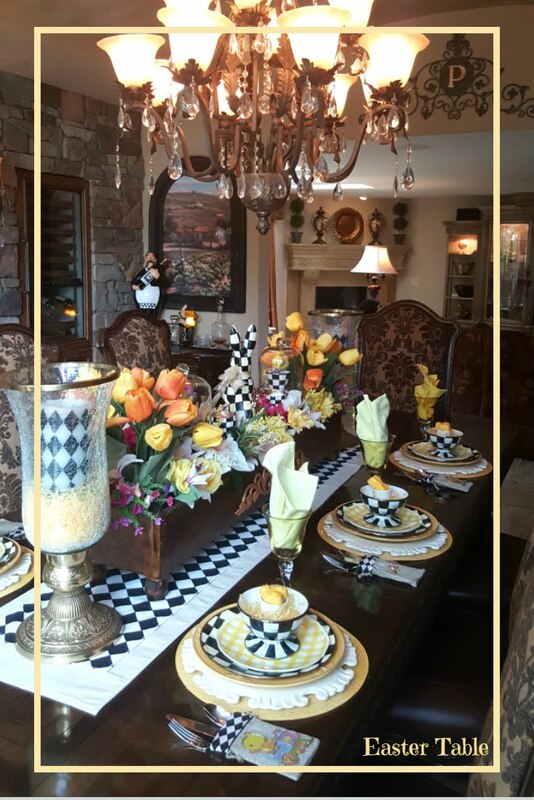 With that gorgeous table setting, I know you will have a great Valentine's day. 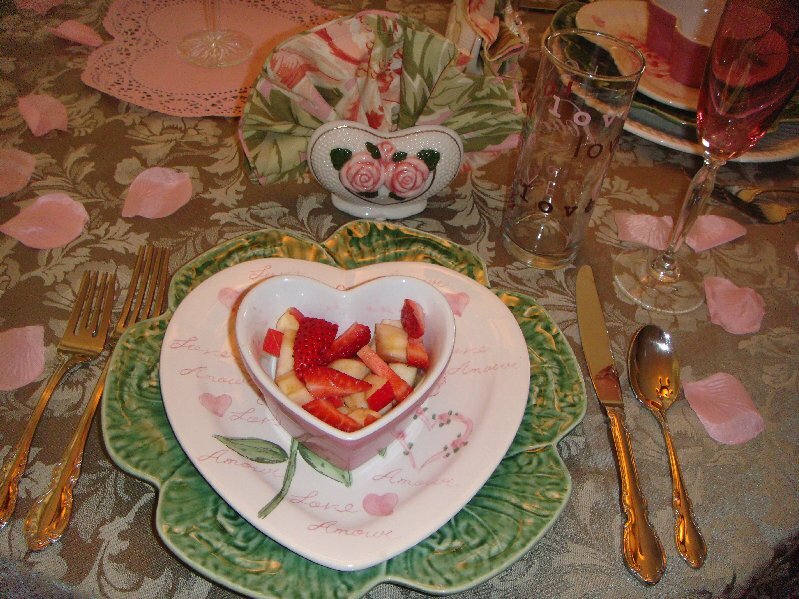 What a beautiful setting, love the heart plates and the glasses add a nice whimsical touch. But those waffels are just so much fun. Nicely done! Thanks for adding it to The Valentines Party and I hope you have a wonderful Valentines Day! What a lovely table! 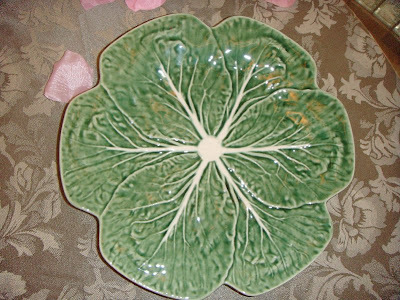 I love cabbage plates. I have matching round plates to those heart ones...they are so pretty. Hope you had a lovely Valentines Day.